According to Amtrak’s Vision for High-Speed Rail, by 2040, its next-generation high-speed rail service could be successfully developed in the northeast with sustained maximum speeds of 220 miles per hour, three-hour trip times between Washington and Boston, and an increase in overall train frequency. 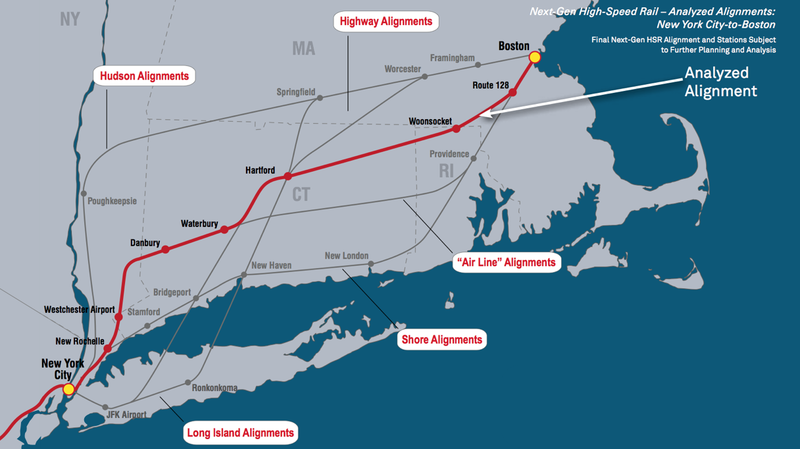 In comparison to the Acela Express, which currently runs along Amtrak’s Northeast Corridor, the next generation of high-speed rail will chiefly be constructed on a new right of way. A number of possible rail alignments have been proposed, but no plans have been finalized, federal funding has not been secured, and construction on this long-term infrastructure project is years away. Amtrak stipulates that a new high-speed alignment would travel through New York’s Penn Station. However, it is unclear whether this stipulation is contingent on the construction of a new station or new cross-Hudson tunnels. Further, it is unclear whether alternative stations would be considered for a future high-speed right of way, as over 85% of the analyzed alignment is outside of the Northeast Corridor. In the future, a high-speed right of way may integrate travel to an expanded Stewart International Airport in Orange County, NY. Or, as demonstrated by several proposed alignments, intermediate stations in Poughkeepsie, Hartford, or Worcester may be served, possibly by west-of-the-Hudson alignments traveling through Bergen and Rockland Counties. Regardless of the final alignment, planning remains in the very early stages and Amtrak is capable of incorporating Hudson Terminal into its Vision for High-Speed Rail. What is clear, however, is that no great high-speed rail network will ever travel through the current iteration of Penn Station. Regardless of what plan is ultimately adopted, maintaining the status quo for Penn Station, cross-Hudson tunnels, and West Side mass transit would be greatly detrimental to the region as a whole. Moving forward, as rail ridership continues to rise and the city grows, it is important to choose the most cost-effective, yet comprehensive, proposal available.